Elephant bars the door. Photo credit: DonkeyHotey / WhoWhatWhy (CC BY-SA 2.0) See complete attribution below. Let’s say you had to rob a bank and there are two ways of doing it: In the first, you’d have to walk into a series of banks with a gun and steal $1 at a time — risking arrest and severe punishment with each robbery. In the other, you work for the bank, can steal $5 million at a time, and, if you get caught, you get to keep the money and face no legal consequences. Which would you choose? If this sounds like a no-brainer, here is an even more ridiculous choice: Let’s say you had to steal an election and there are two ways of doing it: One of them is to convince millions of individuals to cast a vote in states in which the outcome is not in doubt and risk severe penalties for doing so. The other is to use your elected office to deny millions of people the right to vote (or to make their vote meaningless by putting them in gerrymandered districts). If you get caught, there are no penalties and, if you are lucky, nothing will change. Now here is the craziest thing: In the US, there is an actual debate over which of these latter two scenarios is an actually existing problem. With no evidence to support their belief, people like President Donald Trump and Kansas Secretary of State Kris Kobach are arguing that, on a regular basis, millions of ineligible voters risk steep fines and prison (or deportation in the case of undocumented immigrants) to vote in places like California, where Trump got trounced by four million votes. At the same time, state officials, most of them currently Republicans, are doing all they can to deny millions of voters a chance to make their voices heard or to be represented equally. They are facing no repercussions even when they get caught. In 2016, Crystal Mason sought to vote in the presidential election in Tarrant County, TX. Her name wasn’t on the voter roll so, after being assisted by a poll worker, she signed an affidavit in her name — presenting her ID — and declared that she was eligible to vote. She was given a provisional ballot and filled it out. She should have read the fine print and that was clearly her mistake. This isn’t a defense of people who vote but should not. However, it seems clear that Mason didn’t mean to cast a fraudulent vote. She didn’t mean to deceive anybody or to subvert democracy. It was an honest mistake — and she is paying dearly for it. In March, Mason was sentenced to five years in state prison for voter fraud and last week she got an additional 10 months in federal prison for release violations. In a nutshell, these two cases illustrate why widespread in-person voter fraud is so rare while voter suppression, gerrymandering, and other crimes against democracy are so widespread: The former has a very low upside and a major downside; the latter has a major upside and no downside whatsoever. And until the punishment better fits the crime, in the case of the government-sanctioned disenfranchisement of millions of Americans, nothing is going to change. 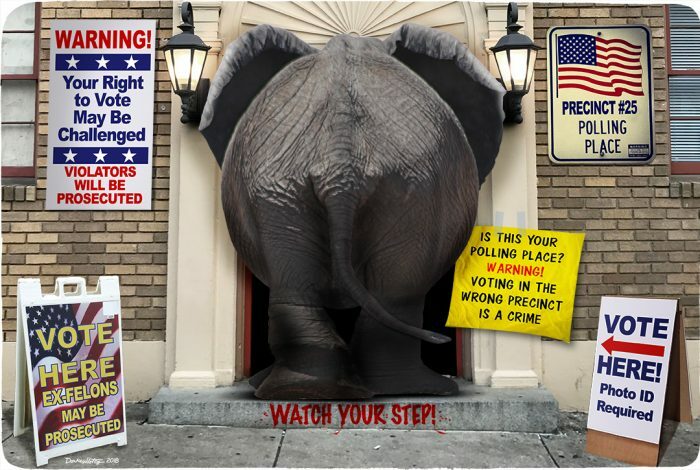 The cartoon above was created by DonkeyHotey for WhoWhatWhy from these images: elephant (Rad Dougall / Flickr – CC BY 2.0), building (Baltimore Heritage / Flickr), ex-felons sign (Tim Evanson / Flickr – CC BY-SA 2.0), voter ID sign (Carmichael Library / Flickr – CC BY 2.0), and flag sign (Jason Dean / Flickr – CC BY 2.0).